“Don’t look a gift horse in the mouth” was one of my mother’s favourite sayings, a swift reminder of our luck. My mother was our family’s undisputed gift horse. MP Michael Woodhouse thinks Anadarko and Shell are Dunedin’s gift horses. In his recent “MP’s View” he reminds us of our collective luck to have these oil giants circling Otago’s deep oceans. Mr Woodhouse asked deep sea drilling opponents five questions, admitting that some might consider them facetious but asking them nevertheless. Such dedication to one’s constituents deserves a considered response. Why do opponents continue to refer to “oil exploration” when they know that if viable deposits are found it will be gas not oil? Mr Woodhouse may know more than the oil companies, who can’t yet tell what’s in the Canterbury and Great South Basins. We must accept the claim that gas is more likely than oil, but the companies don’t rule out oil, as Mr Woodhouse appears to. In a Dunedin meeting last year Shell emphasised the benefits of gas as a “green” fossil fuel, but when asked if they would therefore leave any discovered oil in the ground, answered that since they are a profit-making corporation, of course they would be pleased to strike oil. It would, after all, provide a much easier and larger profit than gas. As for gas being “green”, burning gas releases about 75% the greenhouse gas emissions of crude oil, doing the same damage to the climate in four years that oil does in three. Gas is like the low tar cigarette version of fossil fuels – takes a bit longer but has the same effect in the end. Is it [Oil Free Otago] opposed to deep sea drilling, any sea drilling, or any drilling whatsoever? Human-induced climate change is a fact, as Mr Woodhouse appreciates. Of course we can’t suddenly stop using fossil fuels tomorrow. But to delay the transition in a wilfully blind dismissal of reality is only narrowing our grandchildren’s chances of survival. Opponents of deep sea drilling are choosing to respond to the science. We want progress, using the fossil fuels we can safely use, keeping within the two degree limit of global warming agreed to by the world’s governments, to build a low carbon future. How does it [Oil Free Otago] reconcile its protest last weekend with the use during the protest of fossil fuel-powered vehicles, petrochemical product-produced kayaks, wetsuits, oars, life jackets and other technologies that re the product of oil and gas extraction? The argument that it is hypocritical for deep sea drilling opponents to use fossil fuel products diverts us from useful discussion. We all live in the same world. It’s a world that has been maxing out on cheap fossil fuel energy to the point where a limit is now making its presence felt from the Australian tennis open to California’s driest year on record. While many Oil Free Otago members choose to cycle, drive electric cars and grow our own food, Mr Woodhouse’s government’s policies make a mockery of individual attempts to limit greenhouse gas emissions. The emissions trading scheme (ETS) invites the country’s largest polluters to use the atmosphere as a free carbon sewer. Fugitive methane emissions from a newly discovered gas well in the Canterbury Basin would cancel out all the individual emissions reductions of the ‘greenest’ Dunedin residents in one foul swoop. 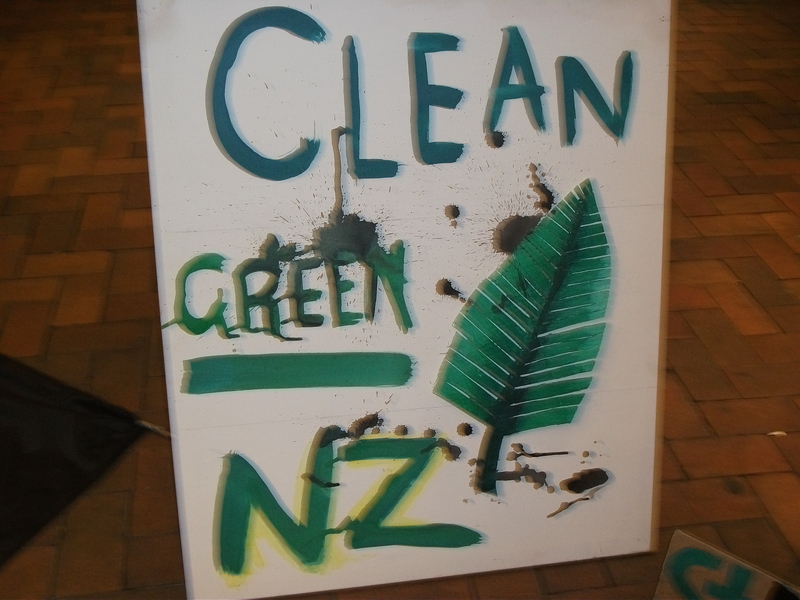 Oil Free Otago members are calling for change. In the meantime we will happily make use of all fossil-fuel tools and products at our disposal in our opposition deep sea drilling. How does it [Oil Free Otago] reconcile Green MP Gareth Hughes flying around the country in fossil fuel-powered airplanes protesting against the very thing he relies on to articulate his message? Until government and policymakers take climate change seriously, beginning with transferring the $46 million subsidy from the fossil fuel industry into clean tech industries, put a realistic price on carbon and begin the other changes needed for a low carbon future, there can be no better use of fossil fuels than to fly Gareth Hughes around the country building the movement against deep sea drilling. Far better that Gareth takes the seat than an oil executive. What is unethical about a product that the whole world relies on for its social and economic prosperity and is vital for developing countries to grow? My first suggestion is for church-goers to attend an Anglican service, and discuss with their Anglican colleagues the reason for their decision to divest from fossil fuels. Learn why we have a moral duty to preserve the planet, not only for future generations but for all of creation. If that’s not your thing, try looking at the hard economic facts surrounding the “carbon bubble” and why it is economically irresponsible to invest in fossil fuels long term. To continue digging up and burning oil, gas and coal in the way Mr Woodhouse’s government intends is to condemn the next generations to an unsurvivable future. Those in developing countries stand to suffer more than us. Unfair but true. Some of us want to make damn sure our back yard is not contributing to that unsurvivable future. There’s a hell of a lot of work to be done, jobs to be had and money to be made building solutions instead of adding to the problem. Oil Free Otago want to be part of that solution. The future is in renewable energy jobs and industries, Mr Woodhouse. I can hear my mother now: don’t look a gift horse in the mouth.